I love road trips but man, they are hell on a diet. I used to allow myself to ‘cheat' when we were travelling, but now we're on the road nearly full time, I needed to find another way to snack. I know we're all supposed to ‘be organised' and ‘prep in advance'… but sometimes that's just not possible. 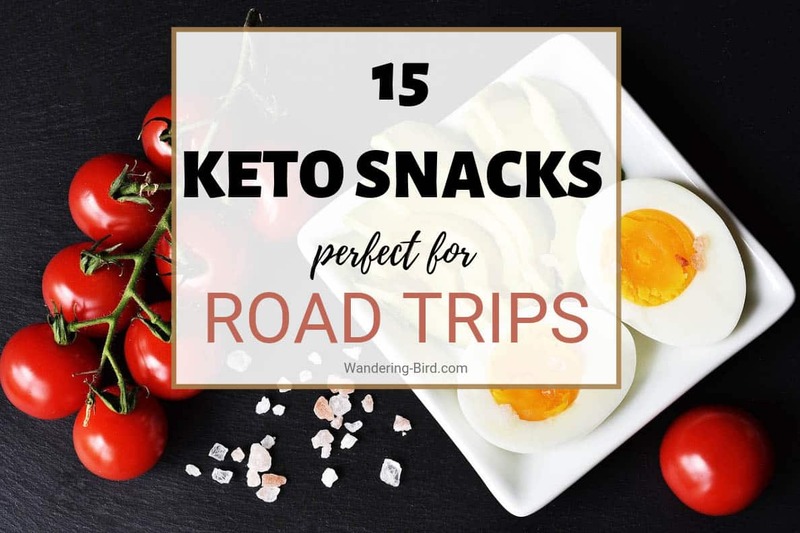 So here are 15 quick and easy Keto snacks to buy on the go– perfect for road trips, travelling or anyone who, you know, hates to prep! Hummus- to dip those veggies in! Hard Boiled eggs -or indeed, eggs of any kind! Sweet Treats- 5 Sweet Keto snacks to buy on the go! Most of these snacks can be found in fuel stations or small shops you pass on the road. Alternatively, google a larger supermarket and stock up there. Pepperoni slices or even some pepperoni sticks are great snacks. Just be sure to buy ones without added preservatives or sugar. Grab a whole range of deli meats and make yourself an easy peasy snack. Even better served with cheese for an instant sandwich! Full-fat cheese is best. Think cheddar, mozzarella or swiss. I love ALL cheese, and it's easy to eat on a road trip. Cut it up into bite size pieces and put in a little pot for easy portion control. I can't stand olives personally, but my husband loves them and there's no denying they're an easy snack. Just be careful how many you eat- they are full of calories! A handful! A small handful people. Portion out a small bowl or bag and snack away guilt free on brazil nuts, pecans, raw macadamia nuts, almonds, hazelnuts and walnuts. Flax seeds and chia seeds are also keto-friendly, along with sesame, pumpkin, sunflower and hemp seeds. Admittedly, you probably won't want to just chomp into an avocado, but pair it with some salad or cheese and meat and it's a perfect and very healthy snack at any time of the day. People think I'm weird for eating avocado with scrambled eggs- but seriously, try it! Bell peppers, cucumbers, celery, carrots (in moderation)- these are all easy to eat cold and an easy keto snack to buy as you travel. I love hummus. It's one of my favourite snack ingredients and pretty much anything tastes good dipped in it- especially the vegetable above. Perfect KETO snacks to buy on the go. This is another ‘I hate them, he loves them' snack- but beef jerky is available almost everywhere and is a perfect road trip keto snack to buy on the go. Many places sell hard-boiled eggs. If you're lucky enough to be travelling in a motorhome or van with a kitchen, you can even cook some in the morning and they'll be cool and ready to go by lunchtime. Just be sure to store them in a safe place which you're travelling. For those of us afflicted with a sweet tooth, any diet is misery. Keto is surprisingly lenient- but this is one area you might want to be organised and try to stock up in advance, although many fuel stations and supermarkets are getting better at stocking appropriate sweet snacks. Raspberries, blackberries, strawberries- all good and easy to munch on the go. Just beware of the juice- those things can stain! Also, beware of blueberries- they have more pesky carbs than other berries. I LOVE chocolate and I love dark chocolate- but dark chocolate without added sugar is pretty miserable. I was overjoyed when one with added Stevia- it almost tastes like the real thing! Are you surprised to find out these are fairly keto friendly. They come in lots of flavours, although apparently, the UK version is nicer than the American version- no idea why. I've only ever tried the UK one and they are pretty good for when you're really craving something sweet. Most peanut butters are not keto-friendly, but some like this one are. Yep- I said cookies! These are high in protein and fat, and low in carbs. Check them out here. What's your favourite healthy or keto snack to buy on the go? Don't forget to check out these other road trip recipes! Want to save this list for later? Pin it to your healthy recipes or Keto board on Pinterest. How to get to Giethoorn- The Netherlands village with no roads!